Ok, Is This Gardening Thing Therapy or Just Plain Hard Work? I have been knee deep — or at least fingernail deep — in dirt lately. I’m not talking about the kind that’s passed around the locker room after aquafit. That dirt doesn’t tend to be therapeutic at all — except maybe for the person who’s dishing it out. I do have to confess, though, that sometimes it’s very juicy and interesting what those ladies have to say. No, my dirt is the plain old gardening kind. Mom in her lovely backyard. Street ordering me to “Get away from that computer, for heaven’s sake, and go outside. Dig around in that dirt, try something new, plant some seeds. Get going!” She can be quite persuasive, well actually bossy, at times. 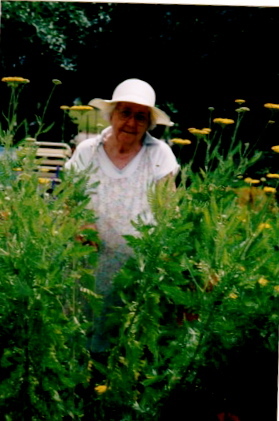 But I should listen to her because she was an amazing gardener — at least in my memories. I always have to qualify any statement I make about Childhood Memories because, who knows, maybe I just made it up and decided to claim it as truth. But I don’t think so. 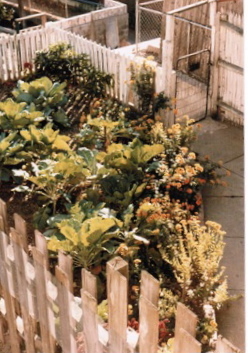 I believe each and all of my siblings would agree that my mother was an Expert Gardener. She would start plotting her garden as soon as that first seed catalogue plopped in her mailbox in February. I didn’t get all that excited about this gardening stuff when I was a kid living in Columbus. To my childhood self the garden just meant WEEDING WORK. There I’d be in that hot hot humid Ohio summer trying to figure out what was a weed and what was a plant. Weren’t they all plants? Shouldn’t we just keep them all? That kind of argument never got far in my household. I personally would have much rather been inside watching Queen for the Day and imagining myself with the ermine robe and beautiful crown. But, no, I only had my starring role on Slave for the Day. And then, at the end of all this work, what did you have? I’ll tell you, you had all those fresh green beans that had to be picked and plucked and then, god forbid, eaten. I always, always totally preferred the ones from the can. Ok, I had no taste as a child. Ketchup was my favorite part of any meal. Truth be told, I probably only had to weed once or twice a summer, but the memory of the injustice is still fresh. Looking down from my DC back porch to my neighbor’s over-exposed beautiful garden. I did wrong but it was bad enough that my sweet neighbors, the Chatmons, who looked down on my garden from their porch, took pity on me. They would train some of their cucumbers and melons over our shared fence so that it would look like I really could do this gardening stuff. And then, knowing I was getting very little produce — ok, NONE — from the back yard, they would pass me over tomatoes and greens and peppers from their harvest. They were the best neighbors — and excellent gardeners. But, you know, I never gave up, ever. 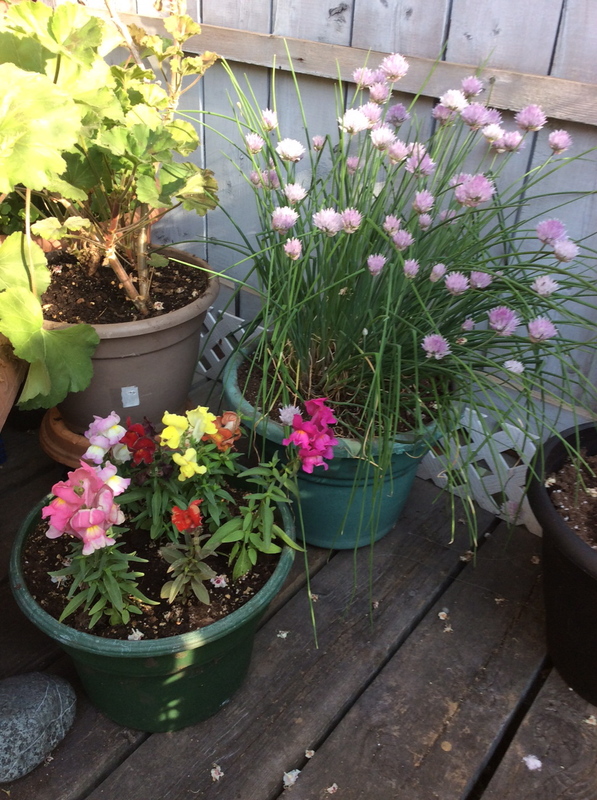 Every year since I’ve been in Toronto, I’ve had my Pots on the Porch Garden. And every year, it’s gotten better and better. Maybe it’s my mother’s ghost lurking around doing funny things at night. The cats think it’s because they lounge out there pretending to keep the squirrels out of the pots (it doesn’t work).They have threatened strike action if I don’t plant some catnip soon. Ain’t going to happen. doing it together for years now. But I also know, in my heart of hearts, that I am a gardener. I know it from the pleasure I take seeing the beans pop out of their shells and sharing my radish plants with the folks next door and checking every day to see if the tomatoes have grown even a little. 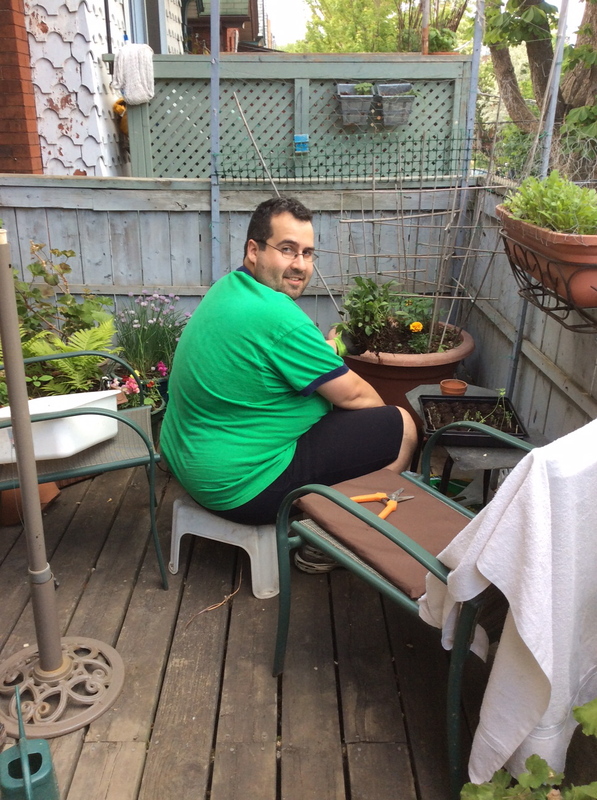 So I guess this gardening stuff is both hard work and therapeutic — especially if you have good folks, living and dead, around to help out. One little corner of my summer oasis. I love this post! And I always believed you were a great gardener – loved having breakfast/lunch, or just hanging out on your porch with all the plants. Didn’t have many occasions to do it – but the few times I did have stuck in my mind. So thanks for the memories!